Please Support Strength in NUMBERS! I mentioned the project in my last post. The lack of Asian American representation in the media is alarming. Here to break down barriers and destroy stereotypes is Strength in NUMBERS. Strength in NUMBERS is a grassroots Asian American music project featuring over 30 Asian American and Asian artists. I’ve backed $10 and tweeting daily to raise awareness for this project. If you love good music and/or minority representation activism there is something here for you. The project has reached $10,000 but it still needs about $14,000 to become real. There’s 5 days to go! I’ve never been into the hip hop scene but I always support the underdogs. There is some great hidden talent in this album. Yesterday all $10 and up backers received a preview version of the album and I’ve can attest to the talent, musicianship, and message of this music. This isn’t fluff. There is depth and meaning, what music should be. If you aren’t convinced, here is a free preview. My favorite tracks are #1, 18, and 19. Now that this is off my chest I can finally get to that homework I’ve been putting off. As if being Asian American isn’t enough of an identity crisis, how about add the fact that you’re adopted? Last weekend I spontaneously watched this documentary Somewhere Between that I found on Netflix. It follows the stories of four Chinese girls who were adopted by American parents. They all lead very different lives, yet they all find commonalities in their stories. Being a product of two cultures myself, I sometimes find it hard to find where I “belong.” Sometimes I catch myself wondering how I am so comfortable around my predominantly white friends yet so proud of my Asian heritage. And then I wonder why I don’t have many Asian friends despite my gravitation towards studying and learning and embracing all types of Asian culture. There is a theory out there about Asian American identity that says that during childhood, one day the kid realizes that she or he not white. They go through a period of “whitewashing” which is followed by a period of extreme Asian-ness (I made up that term myself). Eventually, they find balance and acceptance of their race. This happens to kids who are raised in an Asian household and so far, it’s been true for me. I think I’m between the Asian-ness and acceptance phase. Now what about the case that the child is adopted? I could only imagine that the realization that you are “different” aka not white is more confusing and troublesome. So what makes someone “Asian” besides their race? Because clearly when you are raised by non-Asian parents and grow up as the only ethnic Asian in your small suburban town, genetic makeup is the only thing that constitutes the label. This documentary explores some of these questions. Of the cast, I was especially inspired by Fang (Jenni). Despite being an adoptee she is still fluent in both Chinese and English. It’s times like these when I look back at my own childhood and wish that I kept up my Vietnamese studies. Fang goes back to China every year to help at orphanages and the documentary depicts a particularly touching relationship between her and a young Chinese girl with cerebral palsy. All the while, she is looking for the family/ethnic group that left her to be taken into an orphanage. I think that this documentary goes to show that it’s never too late to reconnect with the culture you were born into. Reading the bios of the cast on the website, I see many of them have started learning Chinese and traveling to China in their college years. I think it’s important to understand where you come from. It helps you understand your family history and yourself. I could go on and on about these topics, but I’ll stop here. Documentaries are starting to become my film genre of choice. I highly recommend this one. It’s available on Netflix and if you check out the website, there may be a screening near you. The next documentary I plan to watch is Seeking Asian Female. Watch out for a little review of that as well! Read Part 1 of July’s Music on My Mind here. One of the main things I look forward to in the summer is a new Super Junior release. Since discovering Kpop in 2010, I have become completely immersed in this fandom called Kpop. Super Junior is my bias (Kpop lingo for all-time favorite no matter what) group. I love every one of their 13 (or 15 depending how you look at it) members no matter if they are currently active in the group, serving in South Korea’s mandatory 2 year military service, or pursuing solo ventures. With Kangin’s return from his army service, I was looking forward to an awesome comeback and was not disappointed. First off, what was SM Entertainment thinking about the album art? Is that what they call effort? Any one with Microsoft Paint could do that. For those of us that are familiar with the Kpop world, we know that SME is one of the largest management companies and definitely has the resources to produce better album art. But, this album is awesome. It has some really fun dance tracks, and some breath-taking ballads. The best of both worlds and what one is to expect from Super Junior. Sometimes, you just gotta improvise! I had been craving sushi for a few weeks now and when I realized there was still an abundance of sushi rice and nori wrappers at my house, I decided I was going to make some myself. 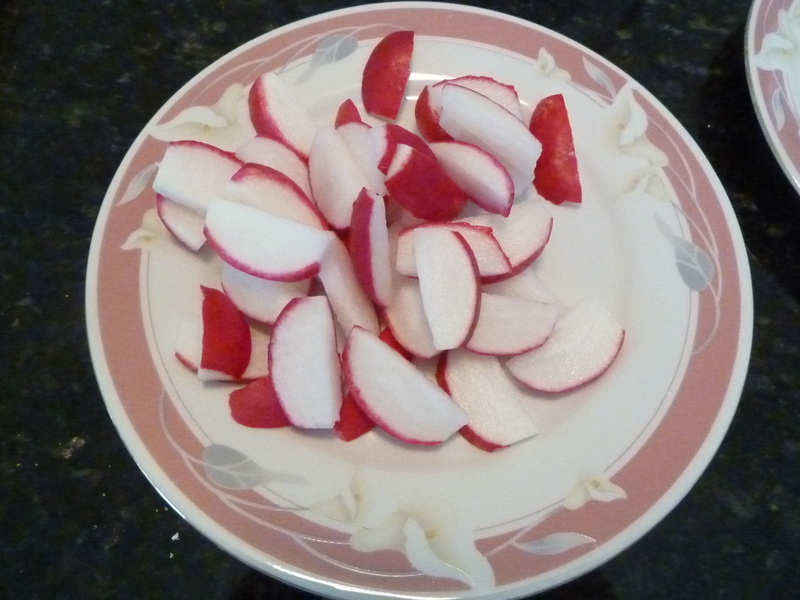 But the problem was the only thing I had ever made were California rolls and we were fresh out of imitation crab and cucumbers. 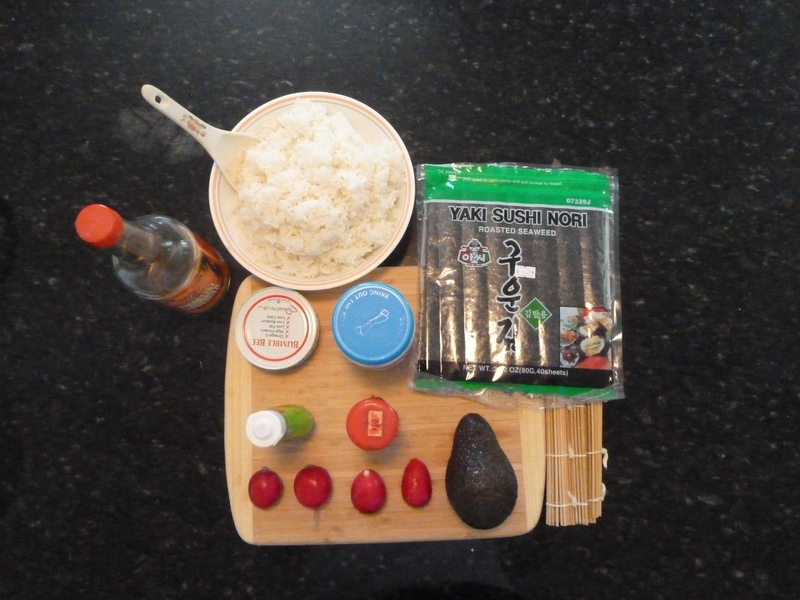 So I set my self on a journey to find a sushi recipe that I had all the ingredients for. Turns out, that couldn’t be done either. 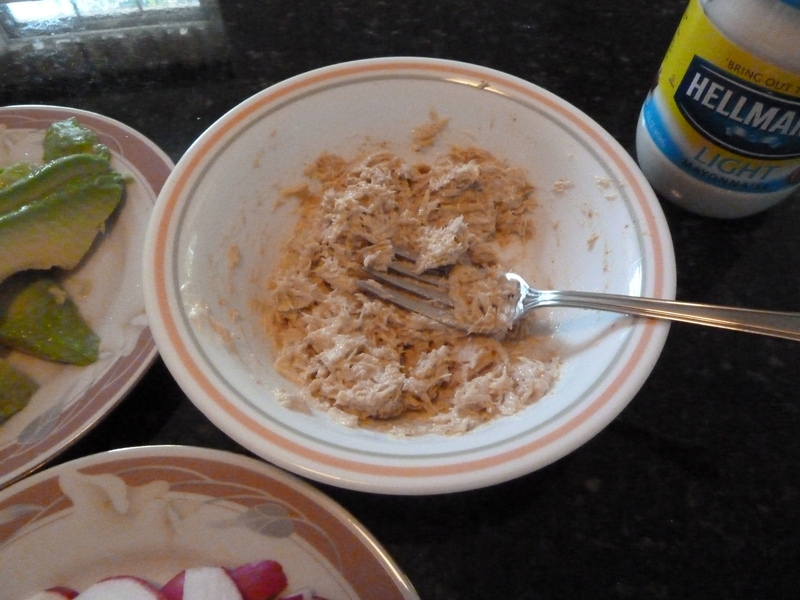 Thankfully, I have exceptional improv cooking skills. 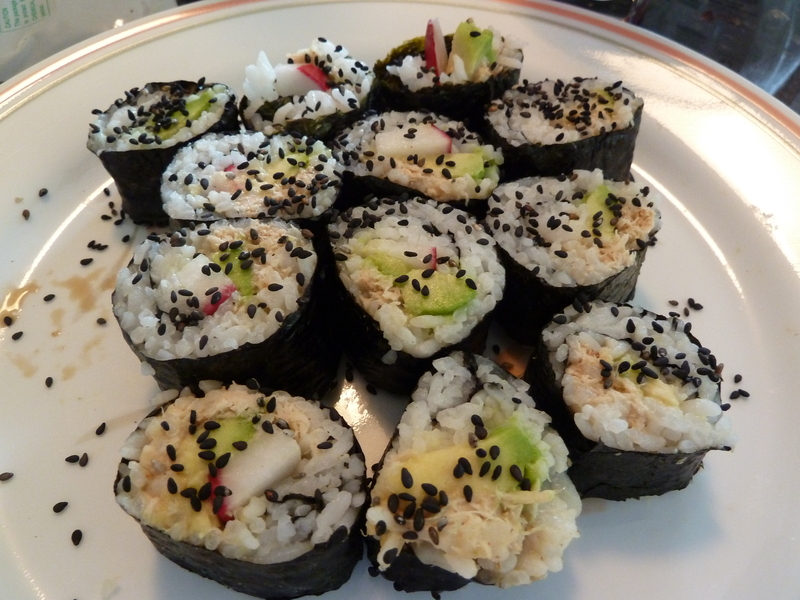 If you are a sushi lover and would like to try your hand at making your own sushi rolls, I definitely recommend www.sushirecipes.org. 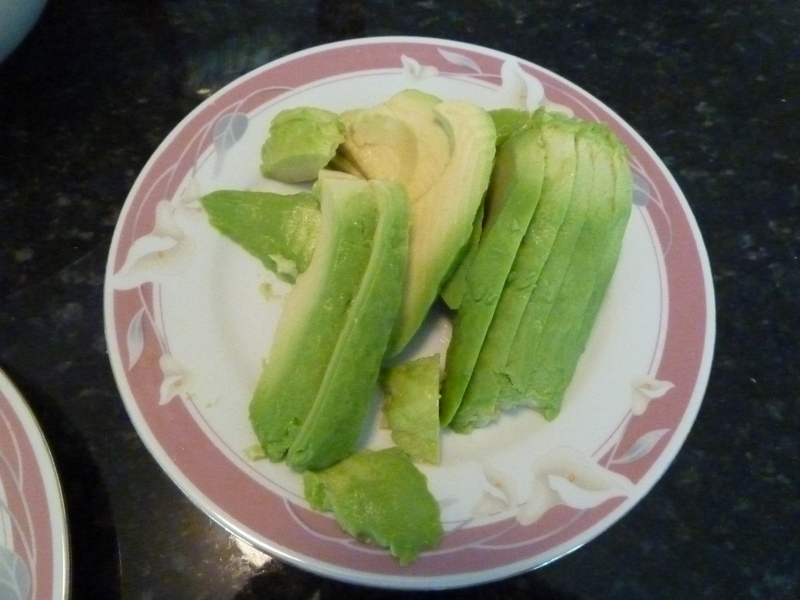 This site has all kinds of sushi recipes, even fruit sushi, which I had never heard of prior to visiting the site! When I planned on making sushi I was under the assumption that I had most of the ingredients need to make some spicy tuna rolls. But it turned out that the bottle of wasabi in my refrigerator had dried up and there were no more carrots because my mom’s been having an obsession with making carrot juice. My plating isn’t the best but these sure tasted good. I made a few variations according to the tastes of my siblings, some vegetarian, and added roasted almonds to a couple rolls for myself. 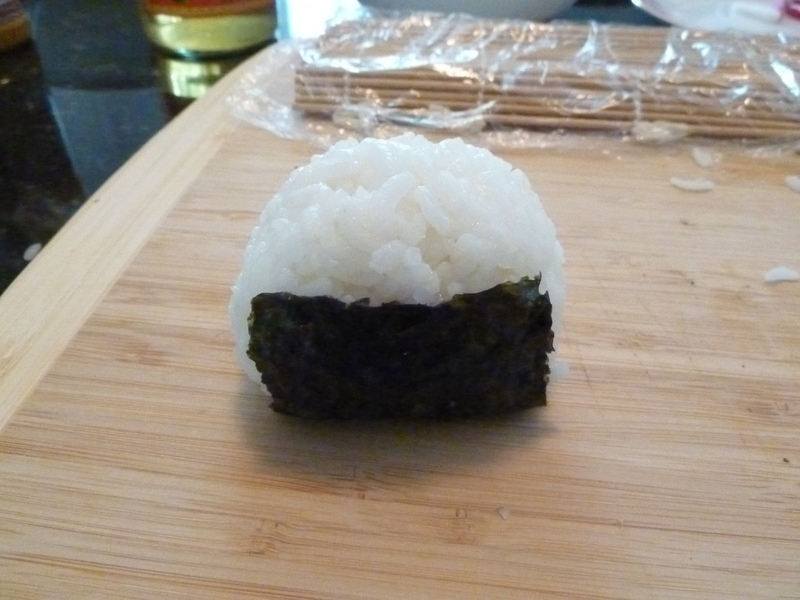 When I had no more fillings left other than tuna, I tried making an onigiri. I’m not really sure what exactly onigiri are or how to make them, but I did read a little about them. Basically, they are rice balls filled with something. 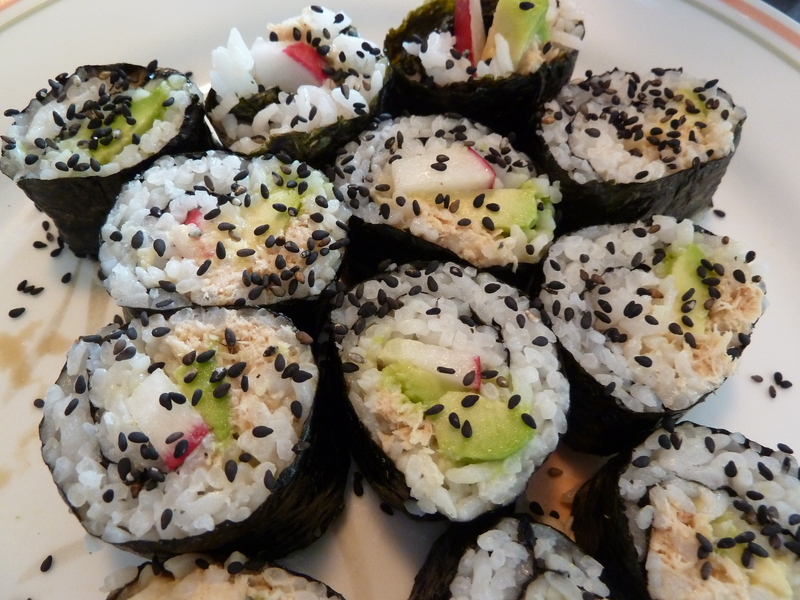 Hope you enjoyed reading about my sushi making adventures! I love all types of Asian food, and after basically all Vietnamese food, sushi is the runner up. I really want to go to Japan one day and eat some authentic sushi and not just the stuff I come up with after perusing my refrigerator and pantry.